Quality laminated plywood construction, with solid wood re-enforcement and mahogany facing, make our cabinets the best on the market today. 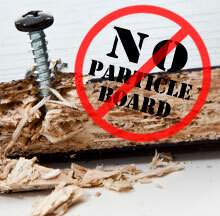 We NEVER use pressed or particle board in the frame construction of your cabinetry or shelving. 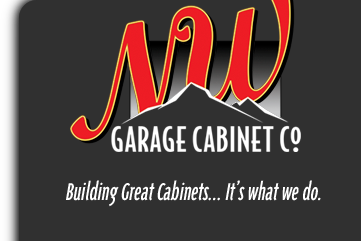 We build cabinets that withstand the changes in temperature and humidity and protect the valuables you store inside. If it’s important enough to keep, then it’s important enough to protect. We build cabinets to last! We offer a wide assortment of finishes to create the perfect transformation from unruly to attractively organized. The unmistakable beauty of natural mahogany contrasting against your choice of white, black, color, camouflage or wood grain finishes, is sure to provide a distinguished appearance for any storage space. Not only do we provide custom cabinets constructed to suit your available space and needs, but we deliver consistent quality at a very competitive price. The method in which our cabinets are constructed, combined with the solid wood products and superior hardware, provides our customers with storage systems that will serve them for decades to follow, while maintaining their original style and appeal. We stand behind our value by offering our customers a limited lifetime guarantee. Our designers meet with you to discuss your individual storage needs. We evaluate your space and we create a custom design layout that fits your lifestyle, as well as work around any structural obstacles that may exist. 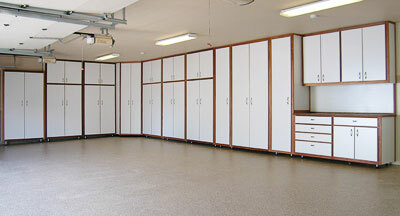 We don’t deal in pre-fab, pre-manufactured modular cabinets. 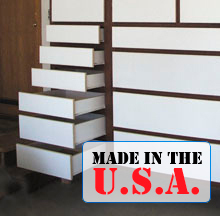 We create custom storage solutions for your garage, home or office. Call Today to Schedule your FREE Consultation Including Design & Layout!